(NewsUSA) – Adults everywhere are reaching for healthy snacks to fuel their families, and a fresh pear’s juicy, subtle flavor pairs well with snacks such as almonds, walnuts and cheese. America’s snacking obsession is about to get fresh with portable, packable, pair-able pears. In season nearly year-round, fresh pears are mainly grown in Oregon and Washington by 1,600 families, who produce about 84 percent of the nation’s fresh pear crop. Pears are available in a range of varieties, from the signature-sweet Bartlett to the crisp, woodsy Bosc to the juicy Anjou. A recent usage study commissioned by USA Pears showed that 46 percent of pear consumers eat them as mid-morning and afternoon snacks. Pears are often considered best eaten fresh and just-sliced, making them a perfect partner for wholesome, simple snacking — think sliced pears atop whole-grain toast, wrapped with prosciutto, dipped in nut butters or partnered with blue or aged, hard cheeses. Half of all eating occasions in the U.S. are now snack-driven. According to a recent Mintel report on snacking, 94 percent of Americans snack at least once a day, compared to just 64 percent last year. Thirty-three percent say they are choosing healthier foods this year compared to last year, with an emphasis on simple ingredients. Millennials are leading the way and are more likely than any other demographic to snack multiple times throughout the day. Pears are a nutrient-dense, fat-free food, an excellent source of fiber and a good source of vitamin C for only 100 calories per serving. To tell when a pear is ripe, simply check the neck.. If the pear gives slightly to pressure near the stem end, it’s juicy and ready for snacking. With a warm growing season in the Pacific Northwest, a greater number of high-quality fruits are available at a “snackable” size — perfect for throwing in a lunchbox, purse or string bag on the way out the door. 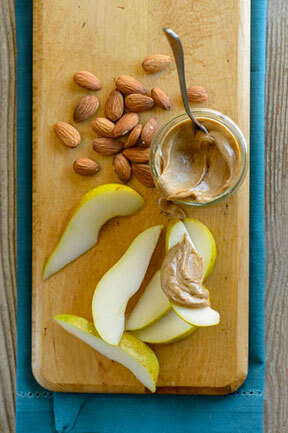 Looking for more simple snacking tips? Think outside the cracker box: * Slice pears atop whole-grain toast * Wrap pear slices in prosciutto * Pair pears with blue cheese, parmesan or aged white cheddar * Dip pears into yogurt * Pack a pear with a small portion of nuts * Smear slices with almond or cashew butter * Sprinkle diced pears onto chia pudding Visit www.usapears.org for recipes, ripening tips and more. Perfect! The Only HDTV That Actually WORKS and it’s AMAZING!